As America's 5th largest airline, jetBlue Airways has made a name for itself by delivering incredible service and in-flight perks at an exceptional value. To promote these innovative customer experiences, the brand's digital marketing communicates their unique voice through playful language and illustrative graphics. We've spent years partnering with the jetBlue marketing team helping them drive sales through their email and digital channels, building lasting relationships with their extremely loyal traveler base. 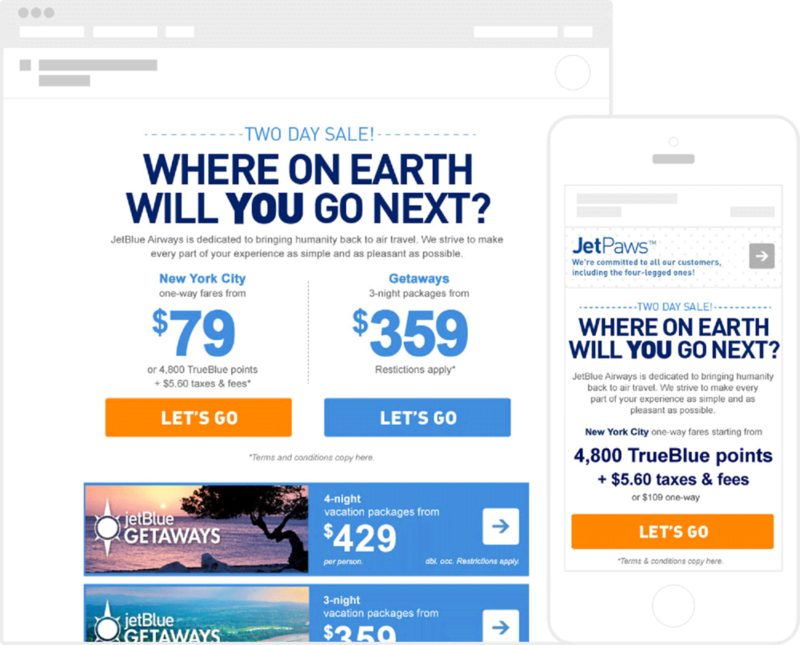 JetBlue's Fare Sale campaign is their most wide reaching digital send, serving almost their entire potential customer base. With such a varied audience, the campaign's design and development process needs to be extremely flexible. While it's previous form was effective in some respects, it was far too limiting. We redesigned their Fare Sale creative and HTML framework to allow for a seemingly limitless number of content layouts, leverage as much actionable customer data as possible and bring in some of the most innovative inbox best practices available. The result was a custom responsive framework with content modules for every possible user type and scenario, personalization geo-targeted fare information and unique content based on customer loyalty levels. We also applied advanced inbox-safe CSS shaping, web hosted brand fonts, a collapsable mobile navigation and a variety of other inbox best practices. This bi-weekly campaign features a variety of promotional elements so we needed to produce a layout that organized content effectively within an intuitive UI. Producing an initial set of wireframes along with lo-fidelity prototypes helped us conduct user tests that lead to an optimal content hierarchy, visual style and mobile approach. With so many locations, loyalty options and customer types, we needed to confirm this redesign worked equally well for every possible user scenario. We created a series of traveler personas to help detail different customer instances. This assured that no matter how you travel with jetBlue, the new framework presented a highly personalized and relevant experience. Before any traveler's flight there is a sizable collection of information an airline must provide, some more helpful than others. Providing a comprehensive pre-flight communication that provides intel a traveler really needs is absolutely paramount. JetBlue had been providing travelers with all of the right details but spread over multiple communications, in different creative styles and an inconsistent content hierarchy. We redesigned and developed a dynamic creative framework that eliminated the messaging redundancy and clearly displayed the important information at the right time. Rearranging the data responsively for both desktop and mobile, we considered a traveler's true needs while their at home versus at the airport. This new communication strongly encouraged travelers to check-in early via the mobile app, use their device directly at a jetBlue kiosk or review flight information in an instant. A color coordinated tabbed approach maximizes the ability to scan for content quickly. Custom developed collapsable modules used advanced inbox CSS allows users to "open" and "close" lengthy content sections for easier viewing on-the-go. More than ever travelers are looking for advice on authentic and unique destination experiences. JetBlue's Out of the Blue micro-site helps to provide jetBlue customers with the latest tips and insider information for their domestic and Caribbean destinations. To help promote the initial launch and continual updates to their new site, we produced a simplified modular newsletter-style framework that the jetBlue team could easily update in-house. Roughly based on similar structures we successfully produced for Burton Snowboards and New York's Museum of Modern Art, the responsive layout showcases beautiful imagery and teaser copy with inbox-safe web hosted brand fonts and convenient thumb-friendly mobile buttons.